Yeah, just the Szechuan vegetable slices and abolone slies in bee hoon soup. It’s a simple but luxury lunch meal! 1) Heat large pot with oil over high fire. Place garlic and stir fry till fragrant and lightly browned. Pour in water and liquid from canned abalone. Bring it to a boil. 2) Add in steeped and sliced Szechuan vegetables, reduce heat to small fire and simmer for at least 1 hour (*You may even add some meaty pork ribs or chicken meat with bones into the boiling to enhance soup taste). Add pepper ans sesame oil to add fragrance. Then, place sliced abalone in a strainer, blanch abalone in the strainer in the soup for just 1 minute. Remove and set aside. 3) Blanch bee hoon in another pot of boiling water for 2-3 minutes. Drain and divide into bowls. Top with desired amount of sliced abalone on the bee hoon. Laddle soup and pour over bee hoon and abalone slices. Garnish ans serve hot. I used overnight soup base. Otherwise, follow the above listed steps. Calorie in this luxury light lunch meal counts about 300kcal. And, that was the simple quickie light lunch meal over my wonderful weekend! Tips: Steep Szechuan vegetable long enough to extract the excessive salt in it. Taste the soup constantly while boiling to make sure it does not taste overly saltish. To reduce its saltiness, you may slice it first before steeping. Remember, the abalone stock from the can is also briny taste. * Just a quick blanch of canned abalone thin slices will do. Do not slice it too thick pieces, and also, avoid over-cooking it as it might turn rubbery texture. I bought New Zealand Abalone in Brine by New Moon Brand. 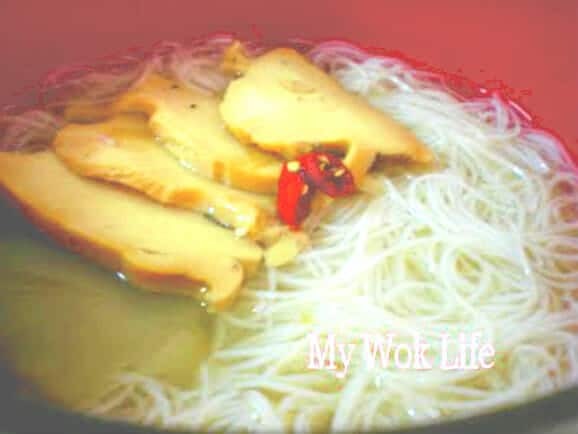 * Choice of bee hoon type good for soup: You may choose brands that come with thinner strands.